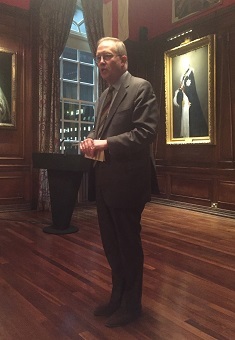 On Thursday 10th of March The Sandhurst Trust hosted Mr. John Baron at the HAC. Mr. Baron was invited to speak to the audience about his career and how the leadership skills he had learnt during his time as an officer of The Royal Fusiliers has influenced and guided him through his career in politics. Mr. Baron spoke very openly about his time within parliament, concentrating on those times he has disagreed with some of the decisions made by the government. Specifically Mr. Baron disagreed with British involvement in Iraq and this then extended to British efforts in Afghanistan. He spoke eloquently about the crossover from his military training into his political opinions - that the error made in Afghanistan was in allowing the ‘mission to morph into nation building’. Mr. baron felt that while we originally had a clear mission, based on sound intelligence with a solid exit strategy this transformation in mission lost the clarity with which it had begun. As the mission became confused, so too did the enemy. Mr. Baron then spoke to the audience about his more current political views centering on the EU. He has been monumental in gathering together over 100 backbenchers from across parliament to speak up against the UK remaining within the EU. He offered the audience the advice that ‘if you think you’re right … go it alone’ even if the odds are against you. During the question period towards the end Mr. Baron expressed his feeling that leaving the EU was not an attempt to stand alone but instead a way of ‘embracing the world’. Throughout the address Mr. Baron’s overriding theme and his advice to all is that we need to focus on investing in good information and to be ‘as well sighted as you can before deciding on a course of action’. Mr. Baron’s parting advice to the audience was to ‘talk softly, but carry a big stick’.